Paper Dolls SVG Cutting file. This SVG file is perfect for your cutting machine. The svg file is an easy to cut out design to make all your pages come together quickly! Our new Paper Dolls Kit & Add on Packs are a sure and simple way to get your projects done quicker! 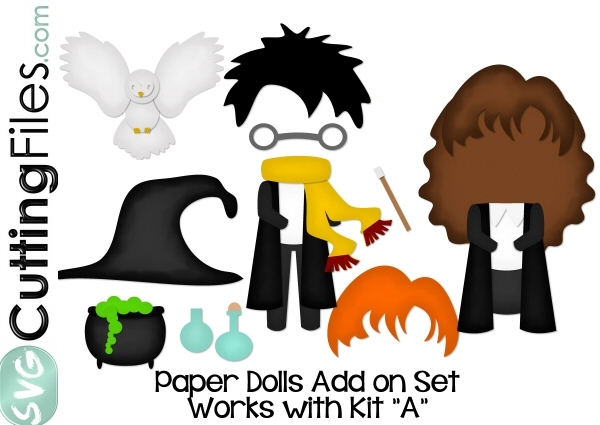 Purchase your base kit doll pack...and then any of the add on clothing and accessory packs to mix and match to make your OWN unique Paper doll! Make sure you match the base kit to the CORRECT add on packs! This file is for the Wizards mini set Add on. Refer to photo for items included.